A pair Source Film Maker films about finding out things about yourself that you don't like very much but also about how technology is dumb magic, consuming, and magic magic. Songs by Colin Stetson, Grimes, The Knife and the Cramps. VO from Neil Postman and David Foster Wallace. Shot in Source Film Maker, edited and graded in Adobe Premiere. It runs badly on the web, so I've provided a .zip that you can run. today's news utilizes the New York Times’ XML feeds to create new images, headlines and color schemes based on the current news. Headlines are generated via a Markov Chain algorithm built into the RiTA text-processing library. ‘Markov’ images are created by sampling a fraction of each image and recompiling it into a whole. Background colors palettes are created by taking color samples from each of the major images on the front page. The result is an ever changing composition- sometimes oddly meaningful, sometimes absurd- that is both generated by the artist in collaboration with the machine, via algorithm, and yet more importantly, by the data itself. The result is inherently political and yet entirely without prejudice. 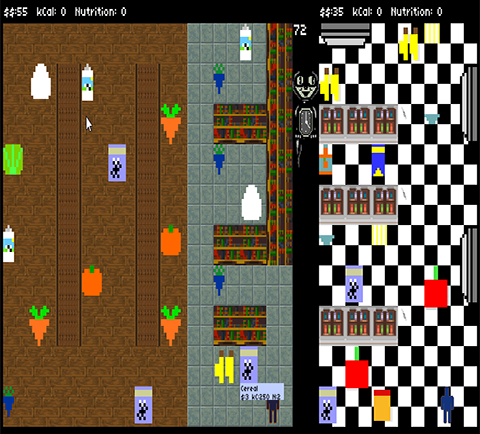 Minimum Wage: Hunger is designed to be played by 2 players at the same keyboard. You can certainly play it solo, but you'll miss out on some of the experience. The idea is simple: Collect as much nutritious food as you can in the time allotted. Because of it's large resolution, Minimum Wage: Hungry is best played in it's own window. Click here to launch Minimum Wage: Hungry. Minimum Wage : Hungry is a game about food deserts, areas of industrialized, urban landscapes where people, often the poor, have little to no access to large groceries and, by extension, nutritious foods like fresh produce. MW:H is intended to be one in series of games looking at the difficulty of being poor in a country as wealthy as the United States. Originally, this was a smaller portion of a larger game simply titled Minimum Wage, but I opted to focus on a smaller section in order to use MW:H as a sort of laboratory for the kinds of mechanics I’d like to employ in the rest of the series. From a design perspective, there are 2 core goals/questions that I’m trying to explore with MW:H. The first is the question of games as a viable medium for the expression of political and social activism. Up until recently, video games really only had a strong foothold in the culture as a result of their commercial appeal. There needed to be substantial investment in their creation and distribution, as well as a wide audience to purchase and receive them. Further, games required a particular brand of literacy- How to use a controller or the assumption that WASD and the arrow keys are interchangeable. This is changing. For the younger generaton, games literacy is part and parcel with cultural literacy. Digital distribution platforms like STEAM or gaming portals like Kongregate.com make it possible to reach millions of customers without a huge publishing contract. Open Source software like FlashDevelop or GIMP bring professional-level tools to the enthusiast at no cost. What this means for a designer is that games no longer need to have a commercial instinct to survive. We can begin to use games to express unpopular or controversial ideas, as we do with documentary television and cinema (Frontline, the films of Michael Moore) or as in novels and non-fiction writing (The Jungle, The Omnivore’s Dilemma). Minimum Wage: Hunger is an attempt to leverage the medium of games as a way to express and explore a political and social issue. It’s my belief that people will begin to look to games- as systems- to explain things to them, to work out complex ideas and to come to conclusions about things that challenge them. I cannot be sure that MW:H is a success in this regard, but it was exciting to make the attempt. The second question is this: Can we leverage game mechanics to elicit specific emotions in players? The popular Models-Dynamics-Aesthetics framework is built on this assumption, but what happens when we want to make a player angry? It’s easy to make a player happy, because culturally this is a preconception about games- They’re leisure. And if they make you mad, you can turn them off. But what about making a player intentionally angry? In MW:H it’s impossible, by design, for the 2nd player to succeed by remaining on budget and purchasing only healthy foods. Inevitably, one player will be frustrated. How can we leverage what we know about game design to force a sympathetic or empathetic experience in players? ? MW:H tries to do this by putting two players right next to each other, introducing a competitive environment and goal and then letting the discrepancies add up. We’ve come to expect games to be “fair”. AAA titles like StarCraft 2 and DotA-clones like League of Legends live and die by their legendary gameplay balancing. MW:H is a purposely and unfairly imbalanced game. It tries to make one player angry and one player happy and in the process creates a play-conversation. Hopefully it spurs discussion, although further play testing will yield better results on how to create, moderate and manage an experience like this. Concerns and Thoughts: This issue is a little near and dear to my heart. I worked teaching Nutrition to inner-city kids in the Bronx and staffing food-outreach green markets in poor areas of New York City. It was absolutely staggering to me that on the A train you could visit what some call the world's greatest restaurant- Per Se- and just 20 minutes later be in a place where it was hard to buy apples. I remember a woman asking me what to do with a banana, she claimed never to have seen one in her neighborhood. For many, the corner bodega was the only option and that meant snack chips, boxes of unhealthy, dry foods and things like juice "drink". Many of these people had no idea how to read a nutrition label. And all of this is happening in developed, urban areas. I wanted to try and talk about this using play and game development as a medium. Because the core gameplay is so simple, a large part of MW:H's affect lies in the physical act of playing the game. Local play (That is, having 2 players at the same keyboard) has gone the way of the dinosaur. Even split-screen play has almost disappeared from the modern gameplay lexicon. As a result, while multiplayer gaming has become more popular than ever, it's less social than it's ever been. Because MW:H has a strong social message that requires a dialogue, putting two people next to each was necessary. Additionally, the proximity helps to create an intense atmosphere. You're not losing to a stranger, you're losing to the person next to you. The proximity is also leveraged in the necessity of sharing the mouse to manage the inventory. At one point there was a keyboard-based interface for inventory management, but playtesting revealed that this lead players to be isolated. Introducing mouse sharing created 2 unique dynamics: It allowed players to create a kind of meta-game that allowed them to shape the tone of the experience (Some players shared well and had an overall positive experience while other pairs fought over the mouse. Some players sought to control the mouse as a show of force.) and it also gave players time to contemplate the game itself- What's going on? Why am I doing so well? Why is my partner doing so badly? When there was keyboard management, it allowed players to keep to themselves and focus purely on score optimization. Also, let's face it, it's got Occam's Razor going for it. It's a far simpler solution. The fact scroll at the end was originally part of the main game- it scrolled along the top of the screen. Players found it distracting and I preferred having the "reveal" at the end of the game. I think most players get what's going on, but I found that from an "experience" stand point, it was better to have them play, digest the results and then read the facts. I'm not sure I ever hit the sweet spot in balancing the food statistics. For the most part, player one ends up with a distinct advantage, but I'm not sure it really expresses the severity of the gap between middle-class, suburban consumers and the urban, working poor. It quickly became a challenge to try and price things in a way that made it feel challenging, while remaining true. Because players can only hold 8 items (I tried 12, it vastly increased the complexity of managing the inventory, led to Mouse-control bottlenecks and generally made everyone miserable), the game is a sort of magnification of the shopping experience. The biggest challenge was trying to accentuate the issues at hand (Lack of access to affordable, healthful foods), while keeping the experience honest. Again, I'm not sure I got there. I got the game to a place where I was seeing outcomes and players were feeling and experiencing the kinds of things I wanted them to and I wasn't sure drilling down to that granularity of detail was necessary. Given more time, it'd certainly be high on the To-Do list, I think creating a simulacra of the buying experience is important to the experience as a whole. The UI is definitely spotty. It felt more important to balance the core experience than to pretty it up. Especially troubling was creating a readable display for the Food Statistics. I don't think I ever got there. The ideal here would be to work with someone who is a better designer than I am because I think a strong visual presentation could really help to reinforce the game's message. Part of the game's core mission was to leverage game mechanics to create a particular set of emotions and experiences. While many players got where I wanted them to, other did not, either because they got wrapped up in the competitive experience or because they didn't "get it". Both of those are my fault- The experience needs to be reinforced and tightened, either by refining existing mechanics or adding new ones. The final scoring algorithm always felt a little off to me. The idea was to make money and nutrition especially important as a way to express the fact that these problems create lasting, exponential effects beyond a single day's shopping trip. I think it just feels a little bit like rubbing salt in the wound. Finally, there's the issue that recent studies have shown that greater access to healthful foods doesn't really change things in effected areas. Many families have no idea how to prepare fresh foods and often lack the time- if they'e juggling 2 or 3 jobs- to cook a meal. Which is a larger question: Can you discern bias in gameplay? Is it fair to steer players towards a conclusion like this? If you read this far: Thank you! Minimum Wage: Hunger is just the start of an experiment to try and leverage games as a medium for personal, political and social expression. There's plenty of room for games as an entertainment medium, I'm just hoping we can start to use them as an expressive medium, too.